The English Summer is full of exciting sporting events – Wimbledon, Ascot,Henley, the Polo – and all of them have a smart dress-code. This week our resident stylist Sian Miller shows you how to still be fashionable, even when traditions dictate how long your skirt is .. This is a light, pretty look for spending all day in. You’re probably going to be eating and drinking, and from my experience of a day at the races, bodycon is not the road to go down! Do yourself a favour and keep it comfortable. This dress is a great example of how you can make a loose, relaxed fitting dress look glamorous. It’s a nice respectable length for a day at the races, polo or a regatta and a pretty print in fresh summer colours. The shoes are a great summer investment, you will get so much wear out of a pair like this and the wedge is perfect for grass based activities… no danger of heels sinking into the ground! The handbag is a great colour, I love cornflower blue in the summer and it picks out the blue tones in the dress. With a vibrant dress like this you don’t want jewellery that is going to compete with it or the look ends up slightly crazy, this gold necklace is really simple but just adds a little extra touch of glamour to the outfit. The dress is the star of the outfit here so everything else is there to complement it rather that outshine it. Lastly, because we all know the way the British summertime likes to surprise us, a lightweight blazer is there to stave off the evening chill. 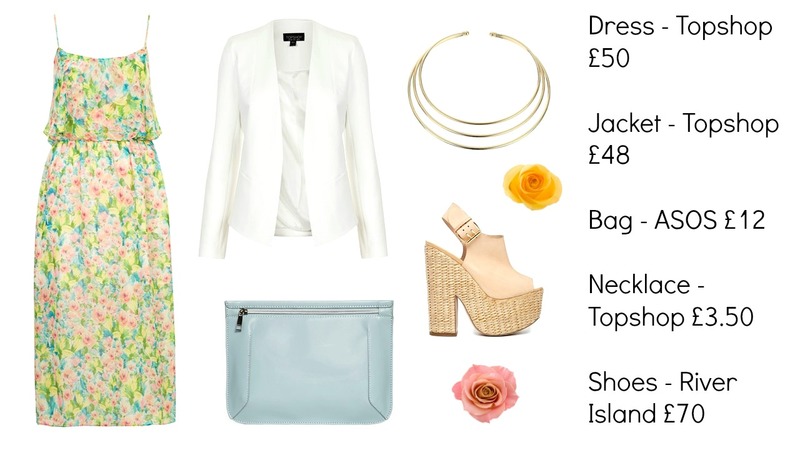 Keep the colour light, anything dark will look too heavy and out of place with the soft palette of this outfit. For those of you who aren’t dress people, a jumpsuit is a fantastic alternative to a dress and great for anyone prone to the odd wobble in heels! This is a really lovely floral print and it’s got a bit of a vintage-esque feel to it. 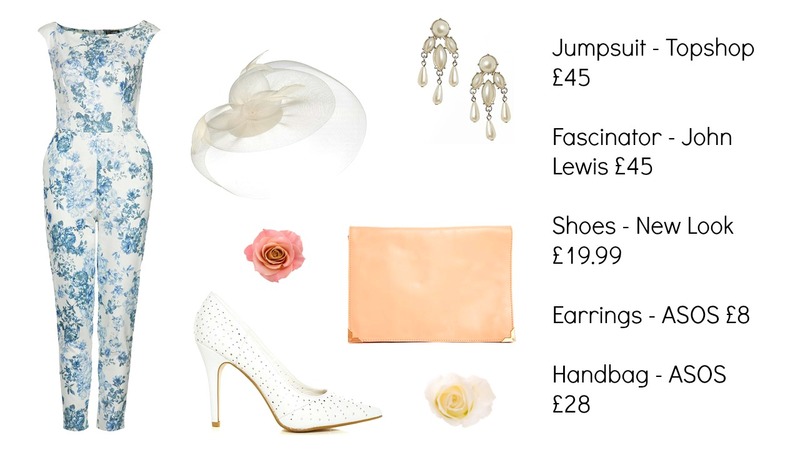 Again, great summery colours and I’ve continued the white theme with the heels and fascinator. I really like this fascinator, it’s really soft and simple and while it’s a focal point, it doesn’t distract from the jumpsuit. With so many components in this outfit, I always find it wise to stick to a colour scheme to keep the outfit looking co-ordinated. Having said that, it is nice to inject a pop of colour in some way, especially with this outfit, to break up the blue and white. I therefore went for a pale orange clutch. It goes really well with light blue and it’s a striking colour but in a muted tone in keeping with the rest of the outfit. I can personally recommend these shoes as I have them myself, they’re nice and comfortable, not too high and are a great addition to a summer wardrobe! Lastly, I recommend a slick of tomato red lipstick for a striking makeup look to complete this outfit perfectly. Sian Miller is a freelance fashion stylist and personal stylist specialising in live events and editorial styling. She’s worked on events for various shopping centres around the country, styling catwalk models and dancers, as well as styling for a number of national magazines. Sian’s blog focuses on showing you how to create different looks, how to style trends to suit everyone and how to make the most out of your wardrobe. You can also contact her at sianmillerstyling@gmail.com for any enquiries, be it work or fashion advice! Sian’s currently in a Virgin Cruise competition, to design the best holiday outfit. Please SUPPORT HER HERE!